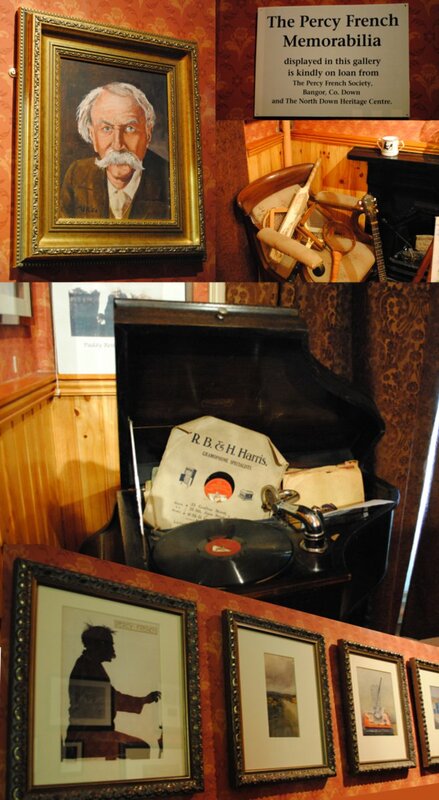 The Percy French Gallery includes a short video of music and songs of Percy French. Cavan County Museum has been very fortunate to receive from the Percy French Society in Bangor a large and varied number of Percy French related items for display purposes. Material on show includes six of Perch French’s original water colour paintings, as well as a large amount of photographs and letters of Percy’s. Cavan County Museum thanks the Percy French Society for their support and co-operation in assembling such a vivid tribute to Cavan’s favourite adopted son. William Percy French was born in 1854 at Cloonyquin House, near Elphin, County Roscommon, the son of a landlord. He began songwriting when studying Engineering at Trinity College, Dublin. He graduated from TCD as a civil engineer in 1881 and joined the Board of Works in County Cavan as a self-styled 'Inspector of Drains'. It is said that he wrote his best songs during this period, including the world-famous 'Come back Paddy Reilly to Ballyjamesduff'. French was also a prolific painter of landscape watercolours and considered art to be his true vocation. In fact, when he became well-known later in his life, his paintings from his time as a civil engineer became fashionable and sought after. When the Board reduced its staff around 1887, French was laid off, and turned to journalism as the editor of The Jarvey, a weekly comic paper. When the paper failed, French's long and successful career as a songwriter and entertainer began. He became renowned for composing and singing comic songs and gained considerable distinction with such songs as 'Phil the Fluther's Ball', 'Slattery's Mounted Fut', and 'The Mountains of Mourne'. But perhaps one of French's most famous songs is 'Are Ye Right There Michael', a song ridiculing the state of the rail system in rural West Clare. The song caused such embarrassment to the railway company that it led to a libel action against French, though this ultimately failed. William Percy French died from pneumonia in 1920 at the age of 65 while on tour in northern England. He was buried in Formby in Lancashire. French was twice married; his first wife Ethel Armytage Moore, who was from Cavan, died as a result of childbirth in 1891, with their infant daughter dying some weeks after. He married again in 1894, this time to a young Englishwoman named Helen Sheldon. Their union was a long and happy one, producing three daughters.